The MacGregor Family: Bye Bye "Ms. Ita"
Today Jackson had to say bye to his favorite teacher Ms. Lalita ("Ms. Ita"). I have never seen Jackson so sad. When Ms. Ita explained that she wouldn't be there tomorrow Jackson said, "I will stay home tomorrow." It was hard to watch. He cried. On the way home Jackson randomly said, "It's okay to cry." We said it depends on why. It's not okay to cry if you want to go outside and we said it was time to bed. Then we tried to explain times when it would be okay to cry. He busts out crying. We told him he couldn't just cry, but he had to also talk and tell us why he was crying. He said, "I am crying because I want my teacher back." I have a feeling it's going to be a while before he's back to himself again. 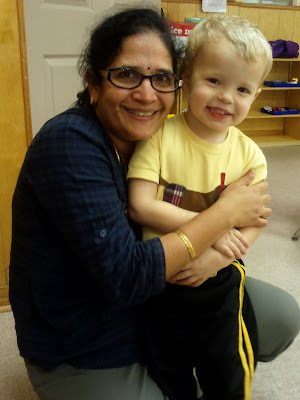 He doesn't adjust to new people at school well and Ms. Lalita will be hard to replace. He's been in her class for most of his life that he can remember. As I type this post, I can hear him in the bathroom with his Daddy talking about it. Oh goodness. It breaks my heart. Poor baby.. it depends on the personality of who replaces her for the most part. Tomorrow will probably be an awful morning and a hard day for him. Maybe a favorite activity promise after school? Let me know how it goes. I wish there was something I could do to fix his broken heart. And yours. Oh my goodness! I teared up reading this. Parenthood is SO hard. Poor little man! !